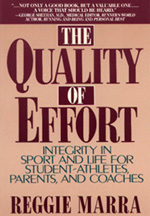 The Quality of Effort, originally published in 1991, has been revised, and is now available in both trade paperback and workbook editions, both of which are also available as Kindle ebooks. Please visit http://qualityofeffort.com for more information. *All bylines appear as they were when the testimonials were given, c. 1990-91. Many have changed.